Splat book with new options for fighters, rangers, rogues, and warlords. Publisher's blurb: "Sharpen your sword and tighten your bow! 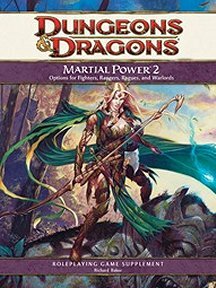 This must-have book is the latest in a line of player-friendly game supplements offering hundreds of new options for D&D characters, specifically focusing on martial heroes. It provides new archetypal builds for fighters, rangers, rogues, and warlords, as well as new character powers, feats, paragon paths, and epic destinies."